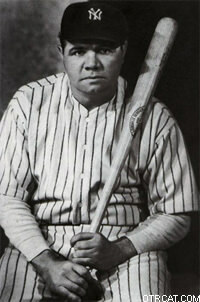 George Herman "Babe" Ruth, the Bambino, the Sultan of Swat, was a true sports legend. He's probably the most famous Baseball player of all time, still. Few remembered him as the great pitcher he was early on, since he became the game's greatest true slugger, the first of the home run kings. His radio career was essentially special guest appearances and sports interviews, but there were actually several shows through the years built around the Babe. These shows were strictly scripted from the best of the Babe, since in the Babe's prime, training was anything but. The Adventures of Babe Ruth was produced in 1934 on the Blue Network, with sponsorship by Quaker Oats, and was the best of the lot. It told in-depth, fully dramatized episodes from the Babe's career, so there was a sense of the real man there in the dugout and on the field.Of course, the Babe didn't say all that much on these shows, but he was really a shy guy at heart, and only learned through trial and error how to handle the white-hot glare of the news flashbulb and microphones of old time sports reporters and radio. He knew millions of kids hung on his every word, so he sometimes choked on the screwball line, but he was a guy paid to hit a baseball out of the park, not field a question. See also the Baseball Collection, Baseball and Sports Broadcasts and Dizzy Dean for much more real sports on old time radio. For great sports reporting, see Grandland Rice and Bill Stern Sportsreel. Be the first to comment on "Babe Ruth"